We often get the questions, “Is inclusive fitness really any different than regular fitness?” or “Can’t all health clubs or personal trainers work with me now that I have had a stroke, heart attack, spinal cord injury, or brain injury.” (and many more diagnoses as you will learn). Is the best and safest place to workout or continue your rehabilitation journey, especially if your medical rehabilitation offerings such as physical therapy or occupational therapy have come to an end. Has exercise specialists, exercise physiologists or inclusive fitness trainers, that have advanced training beyond a basic personal trainer certificate to work confidently with any impairment and are skilled to provide individualized programs for people with medical or disability conditions. Has specialized equipment that is fully accessible, providing adaptations to help make exercise safe with impairments like low vision or poor balance or easy to use from a wheelchair. Offers specialized classes that are diagnosis specific and evidence based (meaning there is a lot of good research to support the fact that it works). 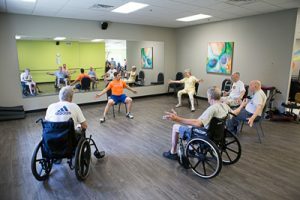 In contrast, a standard fitness facility and their staff usually offer activities that are designed to be accessed by individuals without need for modifications. Standard machines and classes that are geared to a more active population are common. Staff are typically personal trainers with basic certificates, qualified to work with the standard population without any pre-existing medical or physical problems. What makes Exercisabilities an inclusive fitness facility? Our staff consists of Exercise Physiologists, Physical Therapists, Occupational Therapists, Speech Therapists, Dietitian/Nutritionists, Therapeutic Recreation Specialists and Personal Trainers. We believe individuals with any medical, physical, cognitive, or behavioral impairments of all ages from birth to end of life need ongoing efforts in terms of mobility, movement, good nutrition, and exercise to stay healthy and continue on their roadmap to recovery. This need does not just stop when insurances or Doctors say therapy is over. The need is life long. In addition, this road is not easy and often individuals with these impairments have great difficulty exercising they way they should. Our programs offer the right amount of assistance and the right type of care all in the right setting to help everyone with goals to succeed. ExercisAbilities has many programs to fit your need as well as your budget. As a 501c3 nonprofit and MN Home and Community Based Waiver Services provider, there will be a program for you, no matter what your financial resources may be. An adaptive fitness class designed to decrease the symptoms of Parkinson’s Disease. Based on PWR! Evidence-based curriculum. The class combines the use of big movements, loud vocalization, aerobic exercise, boxing work, tango, tai chi, balance training and resistive exercise. Activities are primarily completed seated or with close supervision and are safe for those with fall risk. Learn to regain functionality and self-confidence for daily tasks. An adaptive fitness class designed to decrease the symptoms of Parkinson’s Disease. Based on PWR! Evidence-based curriculum. The class combines the use of big movements, loud vocalization, aerobic exercise, boxing work, tango, tai chi, balance training and resistive exercise. This is more intensive version of PWR Moves I and for those with higher functionality. You should be safe to stand and move dynamically without risk of falling. An adaptive fitness class that will improve your function for any neurologic disorder or injury. Great for diagnoses such as Parkinson’s Disease, Multiple Sclerosis, Spinal cord injury or brain injury. This is a seated class for those with high fall risk. Some out of chair activities will be explored if you are safe with supervision. You will stretch, strengthen, and balance, feel better and move with more ease. An adaptive fitness class that will improve your function. For anyone with paraplegia lower body weakness but intact upper body strength. Great for those with spinal cord injury or spina bifida. This is a wheelchair based class, although, you will do activities out of your wheelchair if able to transfer to floor or equipment. Activities include circuits, strength training, boxing, stretching, yoga, and much more! Great for enhanced training for Paralympic or recreation sports. If you have had a stroke and want to keep active and fit to continue to work on your movement goals in a small group setting, you will love this class!! You should be able to understand and follow 2 to 3 step instructions and be able to sit to stand with only a little assistance or a railing to safely participate. Activities are chair based with some standing and balancing for those who can do so safely. This class is a fun and energizing way to add exercise to your day for those with developmental intellectual disability. You will learn how to exercise for fun while doing strength, agility, and aerobic activities with your friends. Our trainers will assure a 6 to 1 teacher to participant ratio to provide a safe fun atmosphere to lose weight, get stronger, and improve your quality of life and health along the way! A great way to train to compete stronger in Special Olympics events. This non-adaptive class is designed for the person who has little to no experience to working out in a gym but wants to lose weight and get healthy. If you have a medical condition or pain you are going to love this class. You will be guided by a certified Exercise Physiologist in a group setting through circuit training, cardio and strength exercises. Our staff know how to adapt anything for you and make it safe for you to get a great workout. It is a part of our Diabetes Prevention Program, but anyone wanting to lose weight and get fit are welcome to join. This non-adaptive class is the second phase to Learn to Be Fit. Once you learn to be fit and begin to regain your health, you can continue to participate on a more self guided path. Our Exercise Physiologist’s will continue to be available to set up circuits and give you workouts for the day, all while encouraging you to use your knowledge to make your workout your own. It is a part of our Diabetes Prevention Program, but anyone wanting to continue to lose weight and get fit are welcome to join. Call 507-259-7570 for your free fitness assessment or to inquire about classes or appointments. Caregivers can feel safe to leave their loved one and seek respite during the class, participate in the class, or get a pass and exercise on your own. $14.00 per day/class or $50 for a one month unlimited class pass. • Medical Insurance does not pay for fitness or recreation. • Waiver services and sliding scale fee rates for qualified individuals may be available.